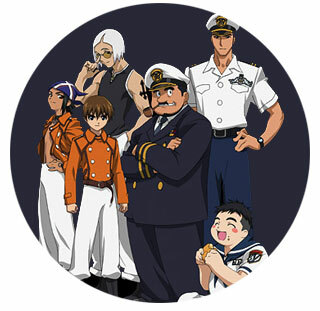 Based on the manga by Satoru Ozawa, this dual-OVA on a disc is a nail-biter that reminds us heavily of Yamato - the grey and red paint job, the "rusting bucket of bolts" with a clever captain versus the latest and greatest technology, and two mavens of the deep who counter each other's moves with precision. We were impressed by the very slick CGI, it matches the look of the cel-anime without being distracting, and yet, produces some of the most "wow" moments of the film. This limited edition version is packed with extras, such as a 3D modeling demo, creator interviews and an art gallery. 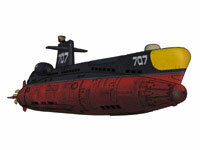 Below: See the sea scenes from Submarine 707R. 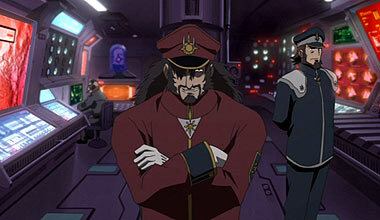 Below: One of things that makes anime great is mecha, and Submarine 707R features tons of Leiji Matsumoto inspired ship design.